January is a month of resolutions, where we all establish new priorities and make resolutions to change our behavior for the better. So before January 2014 comes to a close, it’s time to add one more to our list of New Year’s resolutions — making it a priority to reduce food waste. Change first requires awareness of the problem. I continually find that once individuals become aware of the vast amount of food waste that occurs annually throughout the world (over one billion tons per some estimates) along with the associated waste of resources that goes into producing that food (water, human labor, fertilizers, pesticides) and the environmental harm from transportation, storage, and ultimate disposal of wasted food (greenhouse gas emissions, water pollution, increased landfill space), the enormity of the problem quickly prompts rethinking of individual action. Coupling the environmental impacts of food waste with the social problems of hunger (roughly 1 in 8 across the globe suffering from hunger, roughly 2 billion suffering from micronutrient deficiencies according to the World Health Organization, and the coexistence of obesity and hunger) tends to prompt behavior change. A recent group of students at the University of Pennsylvania attacked the problem of global food waste over the course of an entire semester in a class that focuses on innovation for sustainability. With newfound awareness came individual action: students changed buying behaviors, “shopped their refrigerators first” before heading to the supermarket, sought reduced portion sizes, made increased use of leftovers, sought to donate to those in need where possible, and volunteered hours at a local food bank. To inspire others, they created motivational t-shirts with lessons for minimizing food waste printed across the back. 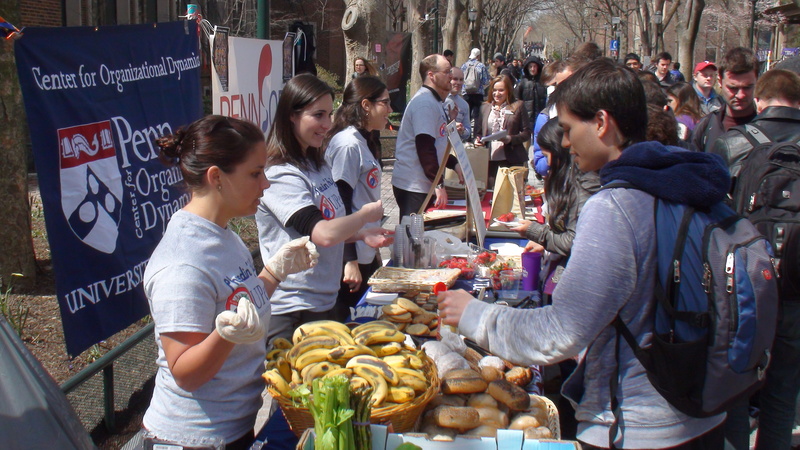 The students also realized the importance of partnerships: collaborating with local food organizations, they collected food that would have gone to waste and distributed that food to hundreds of UPENN students in a highly visible on-campus event. While distributing that food, the group aggressively educated hundreds of participants on the environmental and social problems of global food waste, and — inspired by organizations like Tristram Stuart’s Feeding the 5K — led many to sign a pledge to change their behavior to reduce food waste. They also took to social media, extending their reach across the globe through Facebook and Twitter along with the production of two YouTube videos. Their work, starting with their own awareness, showed that small steps can lead to big changes. So before January (our month for resolutions) ends, let’s take a moment to add one more — committing to act on increased awareness by reducing food waste individually while influencing others to do the same. Such behavior change will drive the momentum for positive change among supermarkets and throughout the supply chain. It is transformative.